In the Caribbean, you can escape to warmer weather, celebrate local holidays and traditions, and of course, hit the beautiful white-sand beaches. December weather is comfortably warm and you'll be packing for the beach. Christmas is celebrated with colorful festivities in a uniquely Caribbean way. If you can break away from family, friends, and the usual traditions December brings, a trip to the Caribbean may be ideal. The weeks in early December are filled with bargain rates on hotels and airfare because this is typically a slow travel time. Many resorts cater to families looking to spend the holidays together by offering all-inclusive packages. Since nearly every Caribbean island has a majority Christian population, it's easy to find local holiday celebrations regardless of where you travel. Christmas cruises to the Caribbean are also an affordable, family-friendly option. On the downside, while early December may be a cheaper time to visit, hotel and airfare prices rise sharply for the holidays and especially for the week between Christmas and New Year's, when many families have time off from school or work. 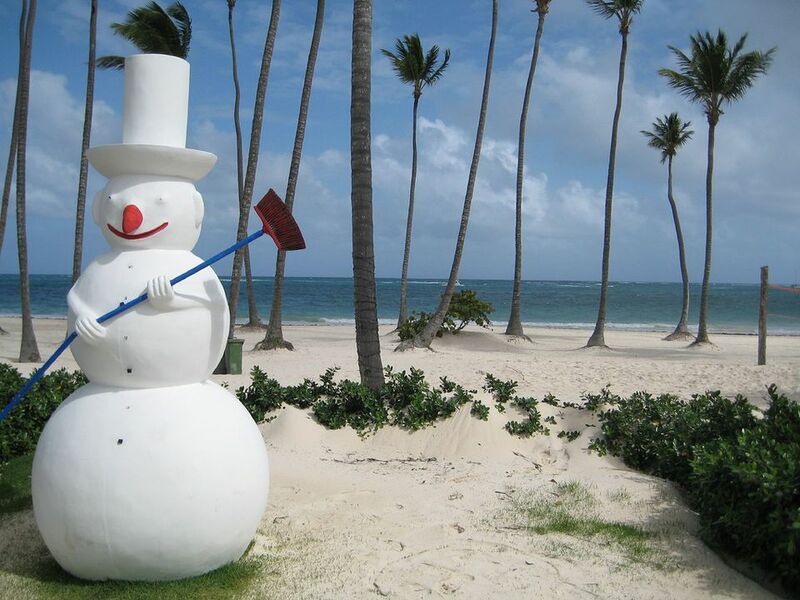 Those looking for a traditional white Christmas obviously will be disappointed, as will those wanting a typical U.S.-style holiday celebration as the Caribbean has few shopping malls, there are palm trees in place of Christmas trees, sorrel instead of eggnog, and so on. But if you're willing to embrace new holiday customs and cultures, it could be an exciting and unique winter vacation. With the threat of hurricanes and tropical storms past, December travelers can look forward to the Caribbean's average daily temperatures in the high 70s (temperatures in Bermuda and the Bahamas tend to be on the cooler side). You might get rain on about one of every three days, but it's more of a light afternoon shower than a torrential downpour this time of year. Pack some bathing suits, summer clothing, and sunscreen for the Caribbean's warm, bright days. Nights can be a bit breezy, so women should pack a light sweater while men should bring long pants. If you plan to visit during the holidays, you'll want to bring along some nice attire, especially if you are going to attend a formal Christmas mass, candlelight service, or holiday meal. The Caribbean has a broad array of unique Christmas traditions. You'll find Christmas Markets in Jamaica, Junkanoo in the Bahamas, parang music on Trinidad, and Sinterklaas and his "Zwarte Piet" (Black Pete) helpers in Aruba and Curacao. St. Lucia National Day: Parties and parades surround National Day in St. Lucia, including sports events, a Festival of Lights, a choir festival, market festival, and feasts. National Day is actually December 13, but the party goes on most of the month, mixing with the Christmas and New Year's celebrations. St. Lucia, the "Saint of Light" and the namesake of the small island, was one of the earliest Christian martyrs. The festival of lights is also celebrated in Sweden, Norway, and parts of Finland in honor of the saint. St. Nicholas Day: This day is celebrated in the Dutch Caribbean. Watch for St. Nicholas (Sinter Klaas) riding his white horse and trailed by his Zwarte Pete minions on December 5, St. Nicholas Eve, in Curacao, Aruba, St. Maarten, and Bonaire. This is the day that good Dutch children hope to find their shoes filled with gifts. Junkanoo: A celebratory parade and party, Junkanoo is exciting and colorful. The largest Bahamas Junkanoo party parades are in Nassau, but you can also experience the intoxicating carnival atmosphere on Grand Bahama Island, Eleuthera & Harbour Island, Bimini, The Exumas, and The Abacos. They take place on Boxing Day and New Years Day. St. Kitts National Carnival: Every Caribbean island has some sort of Carnival; St. Kitts' is unique in that it runs through Christmas and New Years (mid-December through January 2) and is both a holiday festival and celebration of national pride. There are pageants, J'ouvert music (calypso-type music), food fairs, and street parties.